Featured Fishing Photo: Tim McDaniel with a 35lb Striped Bass caught on a small spinning reel spooled with 10lb line, matched to an Ugly Stik of course! while using a blue/silver 1 oz Rat-L-Trap in the Napa River, California. Photo by Bob Fisher. There are 74 topics and 96 posts in this forum. The forum posts have been viewed a total of 177882 times. Fishing Angel Island in the San Francisco Bay for Leopard Sharks, Stickleback Sharks and Bat Rays. There are (26) images in this gallery. Fishing Lake Berryessa in Napa County for Trout, Crappie, Bass. Fishing Lake Comanche in Amador County for Trout, Bass, Crappie and Catfish. Fishing Lake Hennessey in Napa County for Bass, Bluegill. 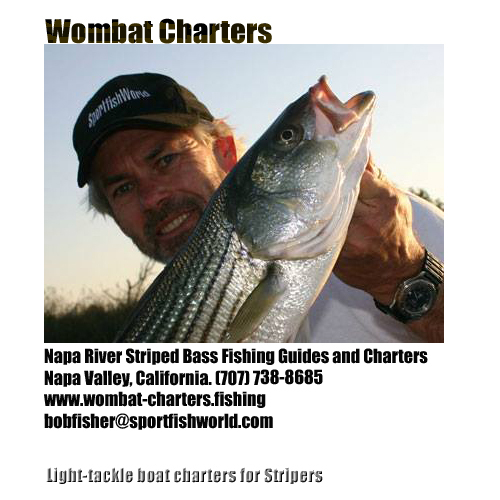 Fishing the Napa River in California Wine Country for Stripers, Sturgeon, Salmon. Steelhead Trout spawning in the creeks of Napa County. There are (17) images of Napa Steelhead on their spawning run in this gallery. Fishing in Florida for Snook, Tarpon, Speckled Seat Trout, Jack Trevalle, Black Drum. There are (96) images in this gallery. Fishing the lakes of Southern Indiana for Trout, Crappie, Bluegill, Stripers, Bass. Photo Gallery for Southern Indiana. Photo Gallery for Missouri. Fishing Lake Ozark for Largemouth Bass and Crappie. Photo Gallery for Washington State. Fishing the Skyomish River in Northern Washington State for Silver Salmon (Coho). There are 147 fishing photos in the general USA fishing photo gallery. The 4 most recent fishing photos are below. We've got a bunch of other photos by fish species or by location and there's also regular reports and updates in the forum as well. There are currently 20 fishing photos in the INDIANA Fishing Photo Gallery. The 4 most recent fishing photos are below. This link takes you to our Feature Fishing Report on jigging for Giant Humboldt Squid. Rich Pharo and I were fishing with Capt. Rick Powers aboard the New Sea Angler at the Cordell Banks out of Bodega Bay in Northern California. Choose a fish species from the drop-down menu then click 'FIND' and FISHFINDER will return all of the available fishing photos for that species in our fishing database for USA . Advertise your Fishing Lodge, Fishing Charter or Guide Service on this page. Folk's, play it safe! You can check the current wind and wave conditions here in real-time. There are direct links to the San Francisco and Bodega Bay bouys below. For all others, click on the image of the bouy above to get to the home page for the National Data Bouy Center and then find and bookmark the bouy closest to your location.